My number one love this month has been the It Cosmetics CC cream, however I won't go into too much detail as I have a review coming soon! This CC cream is honestly one of my favourite bases ever. I've always been a lover of full coverage foundations as I have really dark under eye circles and have never been too confident with anything lighter. Lately I've been loving wearing a lighter base and this is just perfect! I'd say it's light to medium coverage but somehow it just makes your skin look so good! It gives me the most gorgeous and natural looking skin while still covering all my imperfections. I've also really been loving Hoola Lite by Benefit Cosmetics this month. I've always been a fan of regular Hoola but this shade suits my skin so much more while still having the same beautiful formula. Another face product I've been loving is the Papa Don't Peach blush from the Too Faced Sweet Peach collection. It's such a pretty colour and looks super glowy and natural on the cheeks! The last make up product I've been obsessed with is no surprise- Pillow Talk by Charlotte Tilbury. I won't go into too much detail as I have a review here but it's such a beautiful lipstick that deserves all the attention it gets! Skincare wise, I've been loving both the Oskia Renaissance Cleansing Gel and the Pixi Glow Tonic. When I first got the Oskia cleanser, I really wasn't a big fan which was surprising to me as EVERYONE raves about it. However, now that I've been using a more generous amount I absolutely love it! It leaves your skin feeling so soft and smooth- definitely worth the expensive price tag! I've also been loving the raved about Glow Tonic by Pixi Beauty. I put this on after I've cleansed my face and it does a really great job of exfoliating your skin without being too harsh. I thought I'd add a couple of random favourites in this post too, particularly music and shows. I know it may not be everyones taste but I've been loving the Harry Styles album as well as the new one by Paramore! I've also been loving Love Island (after hearing so much about it I just had to watch it!). Finally, I've been rewatching Gilmore Girls for the millionth time with my mum and I couldn't not include it as I just love it so much. Great picks! I've been eyeing that pixie toner and the It cosmetics CC cream. I'm also so keen on picking up the benefit hoola bronzer. I'm a Gilmore Girls fangirl! Love love love that show - it always makes me eat so bad though haha. I've been loving Shameless so much! I'm rewatching it for a second time and it's like my guilty pleasure. I recently picked up the Pixi Glow Tonic and can't wait to use it- I've heard so much about it over the years and have finally have it in my hot little hands! 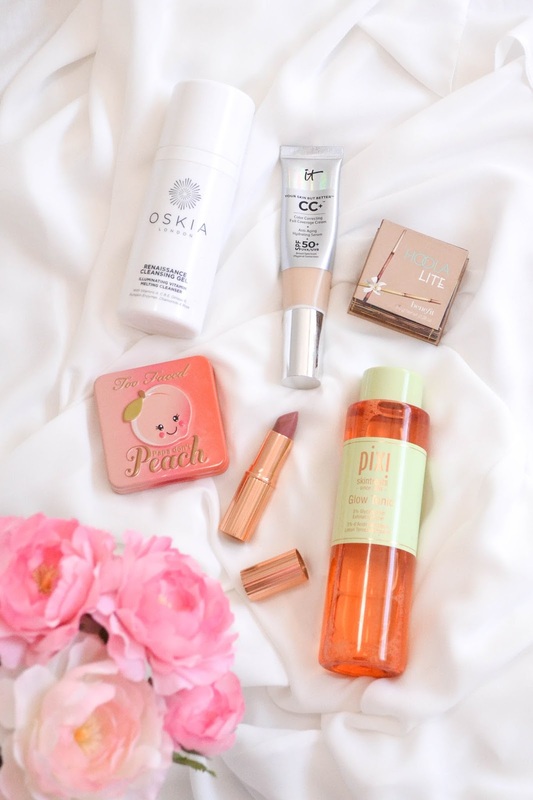 I've also been eyeing the Too Faced Papa Don't Peach blush- the packaging is so gorgeous and I love the blush shade, but unfortunately I just have far too many blushes at the moment to justify purchasing another one. The CT Pillow Talk lipstick shade is so pretty too, loved seeing it all over your Instagram! I love the Oskia cleaner too, I recently learned that you should leave it on for a little while as a second cleanse to really nourish the skin! Pillow Talk is amazing for every season! I would love to try Oskia cleaner as i read a lot of good things about it.